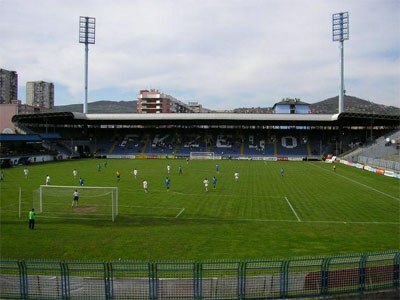 Željezničar's Grbavica Stadium in 2006. Fudbalski Klub (Football Club) Željezničar were founded in 1921 as RŠD Željezničar (Radničko Športsko Društvo, workers' sports society in English). Željezničar means “railwayman”, and as the name suggests, the club were created by people who worked in the railways. Unlike other clubs of the time that had specific ethnic communities backing them financially, Željezničar were more inclusive, in the sense that the team included players coming from varied ethnic backgrounds. Seen as something almost... abnormal by the standards of the era, the club struggled financially, and had to rely on their own means, organizing all sorts of events, so as to find the necessary money for the very basics, uniforms and balls. Even until our time, as recently as in 2016, the club still turned to their own fans for financial support, after deciding to finally do something about their stadium. They used a crowdfunding platform, and in a matter of less than two weeks they gathered enough money to start working on modernizing Grbavica, their historic home. Ideally, they would finance the whole project themselves, but realistically looking at this, the board of directors know that at some point they will need the financial muscles of a strong backer, a bank, or even state funds. Even so, history has written that even to reconstruct their stadium, Željezničar turned first to their all-time classic “source of financial support”, their own fans. The team nearly ceased to exist in the forties, since several of their players were killed during World War I. Not only they bounced back recruiting new players, but they also won the championship of Bosnia and Herzegovina in 1946, before joining the newly-established Yugoslav First League next season. The club won their only championship title in former Yugoslavia times in 1972, finishing two points above Red Star Belgrade. They are one of only two teams coming from Bosnia and Herzegovina to win the Yugoslav First League, with city rivals FK Sarajevo being the other. Internationally, Željezničar had their biggest success in 1985, when they reached the semifinals of the UEFA Cup, the predecessor of today's Europa League. It was Hungarian side Videoton that put an end to their dream to play in a European final, but even reaching the last four was a major success not just for a Bosnia and Herzegovina, but generally for a former Yugoslavia club. The first half of the nineties was the second time the club came close to... dying. First, they had to abandon the Yugoslav First League in the middle of the season, after the war broke out, making it impossible to continue playing. Then, their stadium got heavily damaged, lying in the very heart of the front line. Once the war was over and the torn country managed to establish its own national championship (even though the Republika Srpska clubs joined years later), Željezničar gradually turned into Bosnia and Herzegovina's most successful club, earning their first championship title in 1998, and either winning it again or being in the top two practically every season since then. Željezničar have always been the... football birth place of gifted players, and setting them free (at the right price) has been an important source of income for the club. A striker who started his career there and needs very little introduction is Edin Džeko, just to name the most characteristic example of Željezničar's talent-producing – recent – past. Player transfers were a much-much more complicated issue back in former Yugoslavia times, this is why someone has to go back to the sixties and the seventies to find the players who hold the records at Željezničar. Blagoje Bratić played in a total of 343 official matches for “Željo” (as the team are affectionately called), from 1964 to 1976, spending his entire senior career there. Bratić was a member of the team that won the... precious 1972 championship title, and so was Josip Bukal, who scored a total of 127 goals for the team in official games. Bukal, of Croatian ethnic background, played for Standard Liege as well, but back home, Željezničar were the only team he served. Interestingly, Bukal shares the record of most goals scored with Dželaludin Muharemović, who spent most of his professional career at the club, from 1994 to 2005. He would have broken Bukal's record if he hadn't spent a season at NK Zagreb, and a few months at Volgar Astrahan. As previously mentioned, “Željezničar” means “railwayman”, and the club's link with the railways is reflected on the V-shaped figure at the very heart of the logo, a figure common in emblems of clubs who have a strong connection with railways throughout eastern – mostly – Europe. Actually, a locomotive remains a major Željezničar symbol, with a real one being hosted in the premises of their stadium.